Join the world’s leading expert on trauma Bessel A. van der Kolk, M.D. and understand the latest on how our brains, minds and bodies respond to traumatic experiences. 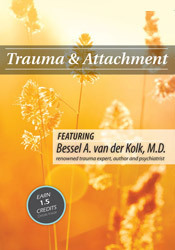 Dr. van der Kolk will explain how affect modulation techniques, EMDR, yoga and neurofeedback are used in overcoming the destabilization and disintegration caused by trauma. Watch this seminar recording and take home an understanding of how these experiences are processed by unconscious interpretations (subcortical) that take place outside of awareness. Learn why therapeutic methods that do not depend exclusively on understanding and cognition are needed to move the client beyond the “replay of the past” in their current experiences. 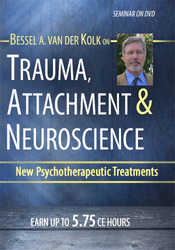 Bessel van der Kolk, M.D. has been active as a clinician, researcher and teacher in the area of post traumatic stress and related phenomena since the 1970s. He founded the first clinic in Boston, the Trauma Center, which specializes in the treatment of traumatized children and adults, in 1982. Dr. van der Kolk was investigator on the first neuroimaging study of PTSD. He recently completed the first NIMH funded study of a new exposure treatment, EMDR for the treatment of PTSD. He was co-principal investigator of the DSM IV Field Trial for PTSD, in which he and his colleagues specifically delineated the impact of trauma across the life span, and the differential impact of interpersonal trauma. His current research is on how trauma affects memory processes; brain-imaging studies of PTSD, treatment outcome of exposure treatment vs. pharmacological interventions, and the effects of theater groups on preventing violence among chronically traumatized youth. 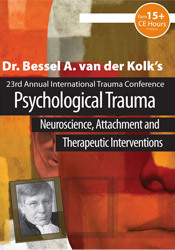 Dr. van der Kolk is past President of the International Society for Traumatic Stress Studies. He is Professor of Psychiatry at Boston University Medical School, and Clinical Director of the Trauma Center in Boston, Massachusetts. He is co-director of the National Child Traumatic Stress Network Community Program in Boston and originator of, and currently on the steering committee of, the National Child Traumatic Stress Network.